Possibly L.E. Smith but no documentation has been found. 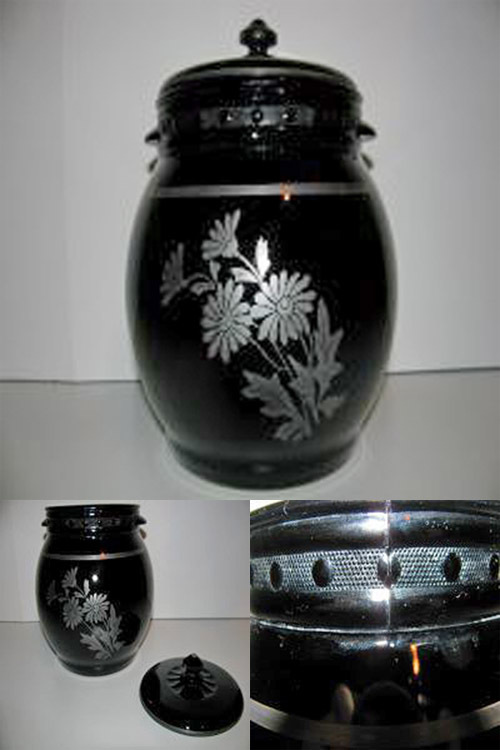 Silver band and daisy decoration with a band of egg-like shapes in a stippled band around the neck of the jar. According to Tom Felt: "The L. E. Smith annual inventories list four cookie jars in black: No. 1 and 3 (which are pictured in my books) and 4 and 5 (which to the best of my recollection are not pictured anywhere). The motif around the top of your jar resembles that on the No. 710 vase, which was made ca. 1930-1938. The No. 4 cookie jar was listed in the inventories from 1931-1933 with silver decoration or red and yellow decoration. The No. 5 cookie jar was listed from 1931-1937, plain or with silver band decoration. My best guess is that your cookie jar is one of these two."